Yesterday was a historic day for American soccer, for the first time in 78 years the United States was victorious over Italy, conquering the Italian side on their home turf in Genoa. Leap Day 2012 marked the end of their ten match winless streak against Italy, previously the most games winless against any country. The performance turned in by the United States was not a dominant one, but through desperation defending, solid goalkeeping, and an opportunistic goal they were able to come away with the victory. 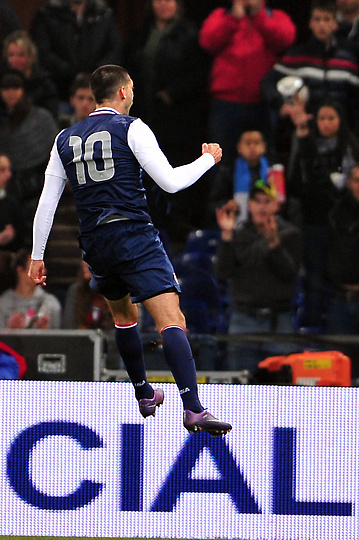 Clint Dempsey was the game’s lone goalscorer, notching his 25th career goal for the United States. The goal came in the 55th minute after Jozy Altidore successfully held the ball up and moved it to Dempsey who found himself space and fired it past Gigi Buffon from 19 yards out. With that goal Dempsey passed Joe-Max Moore to become 4th in career goals for the United States. For most of the game the United States was content to concede possession to Italy, but Italy was unable to make the most of their early opportunities against the USA. While the defense looked shaky during the opening minutes of the game, Italy’s best opportunity came from a Thiago Motta blast that was stopped by Tim Howard. Once the center back pairing for the United States became better organized, they were better able to absorb the Italian attack thanks to some quality aerial defending from Goodson and timely clearances from captain Carlos Bocanegra. Full backs Fabian Johnson and Steve Cherundolo were crucial in creating attacking opportunities for the United States and Johnson was involved in the buildup play that led to Demspey’s goal. The most dominant performance of the day came from Michael Bradley. Bradley was crucial in keeping the midfield together, supplying Dempsey and Altidore while skillfully moving into attacking channels. Bradley’s performance improved in the later stages of the match with accurate passing, timely challenges, and a relentless work rate. Despite being left out by Klinsmann in his early matches, the Chievo midfielder is now making it difficult for Klinsmann to ignore his considerable contributions. Jonathan Spector was crucial in his appearance down the stretch, entering the game in the 77th minute for Fabian Johnson. Spector’s impact was felt through solid defensive work, getting his body in front of at least 3 shot attempts from Italy under considerable defensive pressure. Spector’s contribution to the team was crucial, playing with the poise and experience of a veteran defender. 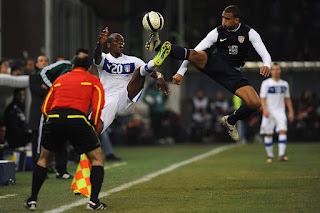 The match also marked the international debut for Terrence Boyd, the German-American made his entrance in the 29th minute for striker Jozy Altidore and immediately made his impact felt through some imposing physical play. Despite not yet featuring for the senior Borussia Dortmund squad, Klinsmann showed confidence in the 21 year old and he repaid that confidence with competent holdup play in the closing stages of the match. While it may have taken longer than initially hoped for, Jurgen Klinsmann’s first signature win as American manager comes over four time World Cup Champions Italy. It was a performance that the squad can be proud of as they continue to improve.